From School Library Journal: "McCully's richly hued, softly textured paintings beautifully evoke the late 19th-century era. 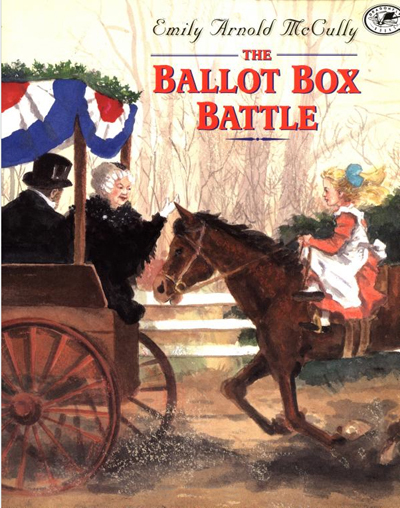 Skillfully weaving fact and story, The Ballot Box Battle offers a history lesson pleasingly framed in a story about an independent young girl. A full-page author's note gives further information on Stanton and on the creation of the book." From Publishers Weekly: "On Election Day 1880, the women's rights activist Elizabeth Cady Stanton teaches her young neighbor a lesson in gumption. McCully's art and story deliver a relevant message gracefully. From Kirkus: "this book gives readers a tantalizing, child's-eye view of an American original, a challenger of social norms and expectations. McCully's dark, vigorously brushed watercolors successfully evoke both period (1880) and personalities: Stanton is a glowering, formidable presence, while Cordelia, with her straight back, pinafore, and large hair ribbon is a poised, blonde soulmate to Mirette." From Booklist: "McCully has wisely given children a protagonist they can relate to in feisty Cordelia, and she realistically portrays the child as more interested in her own concerns than in those of her famous neighbor. The misty paintings evoke the New England setting nicely, and the contrast between the fresh young child and the white-haired older lady is particularly effective."